There are two things that I never say. First, I’ve never said I was a nice person. This gives me free reign to be mean when I have to and not be apologetic about it.The second is that I’ve never said I was a good cook. Don’t get me wrong, I really enjoy cooking and am always on the lookout for new things to try. Since going vegan, cooking has become one of my main hobbies and something that I enjoy doing with others as well. However, like yoga, soccer, and gymnastics, just because I enjoy doing something does not mean I am good at it. Case in point. I had a real desire to make my own falafel. The Hungry Pocket, a falafel restaurant/juice bar in Santa Monica, has really amazing falafel. My co-workers grilled the owner about it and came back and reported that the falafel was indeed vegan, so I went down to try it out with them. They were delicious, that is for sure. On the other hand, I knew deep down that I was pigging out on a deep-fried ball of chickpeas. Since I am working on being more aware of fat in my diet, I wondered if I could make my own falafel in the oven, with just a little bit of oil brushed on top. At any given time, I have about 3 or 4 different culinary schemes brewing in my head, just waiting for the perfect excuse to execute them. I decided to try out my falafel recipe for a picnic. 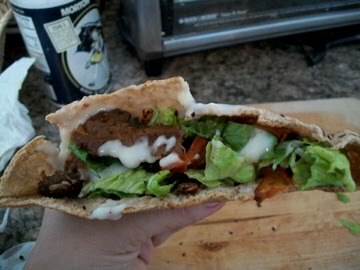 I stuffed them in pita bread with lettuce, roasted tomatoes, and tahini.The idea was great, but the falafel was a little off. I tried a root-cause analysis, but wasn’t able to put my finger on it. Luckily, Short Round (the sidekick to my culinary Indiana Jones) was able to put his finger on it. The cumin in the falafel made it taste more like Old Bay seasoning, therefore giving the entire thing the flavor of a crab cake. So I am pleased to present my readers with my completely original, absolutely accidental recipe for vegan crab cakes. Drain the chickpeas and pour them into a food processor. Pulse for a few seconds until they start to break down. Remove half of the mixture and place it in a medium sized bowl. Add the onion and garlic to the food processor and pulse until smooth. Mix this into the rest of the chickpeas. Stir in parsley, cumin, salt, and corn starch. If the mixture is too dry, you can add vegetable broth, one tablespoon at a time. Remove dough from the freezer and line a baking sheet with parchment paper. Pre-heat the oven to 375. Form the dough into balls (about the size of a golf ball) and place on the parchment. They will flatten a little bit, but this is the price you pay for better skin and smaller jeans. Brush the top very lightly with extra virgin olive oil and bake for 7 minutes. Flip the falafel and brush the other side with oil. Bake for an additional 7 minutes or until golden brown. One of my many quirks is an intense aversion to mayonnaise. I’ve never liked the stuff and I can’t eat anything that I know contains mayonnaise. This distaste has carried over to veganaise as well. I don’t even know whay mayonnaise tastes like, because I’ve never been able to stomach the site of it, let alone put it to my lips. On the one hand, this is probably not a bad thing, because who wants to eat something that so closely resembles cellulite? On the other hand, my issue with this particular spread (plus my dislike of mustard and my refusal to eat lunch meat, even vegan lunch meat) has long kept me from entering into the world of sandwiches. I’ve never gotten behind them, which can make packing lunch for work a little bit more difficult than it has to be. I was screwing around the Apple store a few weekends ago, waiting for my new bff Collin to activate my new i-phone, and started playing with the Whole Foods application on a demo phone. I will say it was pretty cool, but it also had a great recipe for a vegan muffaletta sandwich. I didn’t bother to write down the recipe or anything, but the idea of a sandwich with mushrooms and roasted red peppers haunted my thoughts all day. So, I gave in to the dark side and made a sandwich. After learning that my vegan jambalaya was a bastardization of all things cajun, I abandoned the idea of even calling my version of the sandwich a muffaletta, but it was very much inspired by the idea of one. 1. Slice your mushroom and mince the garlic while heating a pan over medium high. Spray with cooking spray and add the garlic, sauteing for 1 minute. Add the mushrooms and cook for an additional 4 minutes. You can also add the red pepper to heat it if you plan on serving the sandwich hot. 2. Lightly toast 2 pieces of sourdough bread. While the mushrooms are cooking, cut the artichoke heart in half and smash it into your toast with the back of a spoon. This is your veganaise substitute, and it is MUCH better. 3. Layer a few pieces of lettuce on top of the artichoke, and spoon the mushrooms and garlic over it. Add the red pepper and you are in business. Gyros are something that I never liked as a non-vegan. I had never even tried one, so it was puzzling when I found myself craving them a few weeks ago. I’ve also been making it a point to expand my main dish repertoire. Sure, I give good breakfast, but a girl has to diversify. Also, I’ve been bringing my lunch to work every day, so I’m always looking for something that I can bring in and assemble quickly. I suppose you could assemble these at home without the soy-yogurt sauce, but even then I would worry about my pita getting soggy. As it was, I toasted the pita lightly and packed everything separately. 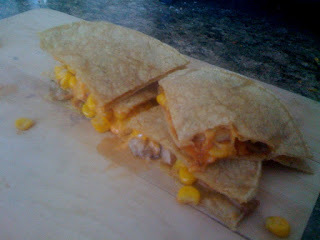 The picture to the right is from when I made them at home for dinner. I don’t want anyone accusing me of doctoring blog photos. Originally I wanted to use seitan for this recipe, but Trader Joes was fresh out and I did not feel like making a trip to Whole Foods, so I ended up with beef strips. After relaying the recipe to a friend, I was informed that TJ’s beef strips are actually Morning Star beef strips. Morning Star discontinued them, but Trader Joe’s sells them under different packaging. It’s funny to me how elusive some vegan food can be. These beef strips are shrouded in mystery. It really goes to show how far we vegans are willing to go in pursuit of a good meal. Saute the garlic and onion over medium high heat for 1 minute. Add pre-cooked beef and cook for 5-7 minutes or until heated through. Stuff half a pita with some of the meat mixture, lettuce, tomatoes, red onions, and Tzatsiki.